The change takes place effective immediately, with FS1 substituting other programming in its 11 p.m. ET time slot. Soon after Awful Announcing reported that FS1 has decided not to renew Garbage Time (at least in its current format), the network has decided to cancel another show that started off with so much promise, but was ultimately left to wilt. According to SportsBusiness Daily’s John Ourand, FS1 is canceling Fox Sports Live. Furthermore, the contracts of hosts Jay Onrait and Dan O’Toole will not be renewed when those deals expire in March. Onrait and O’Toole were hired from TSN, where they were an extremely popular anchor team that called to mind the on-air chemistry between Dan Patrick and Keith Olbermann that made their version of SportsCenter must-watch TV in the mid-1990s. Fox Sports Live made its debut in August 2013 and was intended to be the network’s flagship highlights show. At the time, the two told The Big Lead that they believed highlights could be used to tell a bigger story, not just chronicle what happened in a particular game that night. Additionally, panel discussions including athletes were a part of the show. Unfortunately, things quickly changed at FS1, notably new upper management and its feelings toward sports highlights shows. Fox Sports National Networks president Jamie Horowitz held low regard for such programming. He and Charlie Dixon (executive vice president of content for FS1 and FS2) have put their focus on opinion-based, “embrace debate” content — notably during the daytime. In an interview with The Hollywood Reporter‘s Marisa Guthrie last August, Horowitz made his views on highlight shows quite clear. How much freedom has Shanks given Horowitz? #SuperBowl commercial for @FS1 launch built around @foxsportslive This couldn't have been easy. Fox Sports Live typically began at 10:30 p.m. or 11 p.m. ET, but was quickly affected by FS1’s lack of live sports content at night. There was little to keep viewers tuned to the channel when the show went on the air. 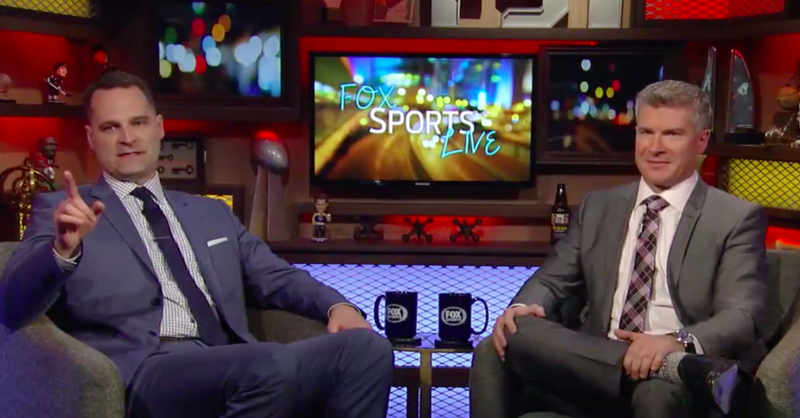 Despite the best efforts of Onrait and O’Toole, the show was also hurt by an increasing disinterest in sports highlights — or rather, waiting for a nightly show to watch those highlights. Standout plays and results are immediately available online, especially social media, thus reducing any need to watch them on TV. FS1 quickly became a much different network than the one Onrait and O’Toole (who voiced his displeasure on Twitter) joined, Accordingly, what was once viewed as its flagship show underwent several format changes and significant cuts during its nearly four years on the air. For example, the panel discussions were soon cut, especially as many of the personalities involved were not renewed with FS1. But the most notable (and drastic) of them took Onrait and O’Toole out of the traditional broadcast studio and put them into a much smaller room (a “prop room,” as O’Toole called it) with the intention of creating more of a late-night talk show, such as Bravo’s Watch What Happens Live. If you’re a fan of Onrait, however, it looks like he’s already found himself a landing spot. Silver lining for @JayOnrait after cancellation of @foxsportslive — Hearing he will be returning to @TSN_Sports in Canada. With Fox Sports Live canceled, FS1 will put a variety of shows in the 11 p.m. ET time slot, such as College Hoops Extra and UFC content. Once the MLB season begins, the network will have MLB Whiparound in that slot.